Another incredibly warm summer is upon us and we are busy helping our clients remain safe and ready for Hurricane season which kicked off June 1st. Thank you to all the volunteers who came out to help with our Hurricane Preparedness Bagging recently held at the Jacobson Family Food Pantry (see page 4). Together we assembled 450 bags filled with flashlights, nonperishable food and water, and important information on what to do before, during and after a storm. While JFS is not a first-responder agency, we play an important part as a second responder – identifying our most vulnerable clients, reviewing our plan of action so everyone knows what to do before, during and after a storm. 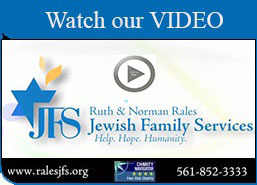 JFS works directly with first responder agencies advising them when our most vulnerable clients are in need of help and, once roads are cleared, going in to check in on our clients and their neighbors to see how we can be of assistance after a storm. This past spring I was humbled to receive the FAU Distinguished Alumni Award for the College for Design and Social Inquiry (page 4). 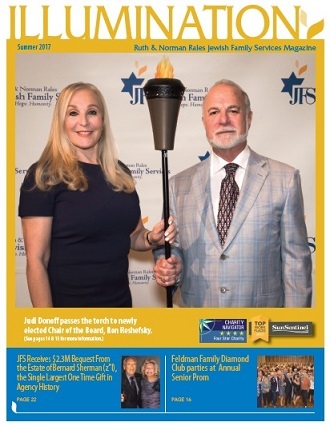 I was very honored to have my family and several key JFS representatives with me to receive this meaningful recognition of my work here in our community and a nod to our strong partnership with FAU. I am proud to note that 12 of our current staff are FAU Alumni and several had their internship with JFS prior to being hired. We are truly blessed to have such a wonderful university in our backyard, ably led by President Kelly, and I look forward to continuing to grow our partnership in the future. Stay safe and enjoy your summer and I look forward to seeing you all in the fall.